If you are a NRI settled in USA, if you are a movie buff and acting is your passion, here is a once in a lifetime opportunity. S A Media and People-Media have joined hands to produce a bilingual movie in Tamil and Telugu to be shot entirely in USA. Hence, the production house plans to cast all NRI actors in the movie. While S A Media is a new production house, People-Media is actively involved in successfully conducting major events for Telugu people in USA. “This is a wonderful opportunity to the aspiring Indian actors from America. Usually, we have Indian actors in films shot abroad but the makers of the film have come with a unique idea to cast Indians settled in America. I know many NRI’s who have been well settled there in USA and are also great fans of cinema. 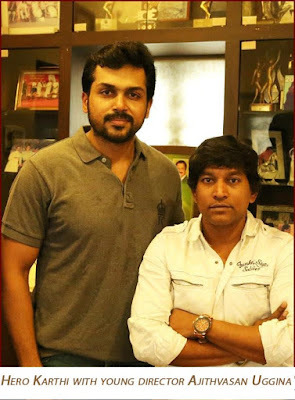 I hope this movie will make their dreams come true” said South Indian star hero Karthi. The makers have released a casting call video featuring Hero Karthi. The movie requires 5 young boys and 8 young girls for leading roles as heroes and heroines. And also there are several characters of all age groups needed in the movie. “Though the movie is a bilingual in Tamil and Telugu, language is not a barrier. We welcome NRIs from any language if they want to act in our movie” said filmmakers. This bilingual movie will be directed by Ajithvasan Uggina. A protégé of top director S.J. Surya, the young director has worked for many hit movies and with stars like Thailai Ajith, Pawan Kalyan, Maheshbabu, Dhanush etc. Experienced and noted technicians are working for the project. “The story is all set in USA. Hence we have decided to cast all the cast from American NRIs only. It will not only be unique but it will also help explore fresh talent among them” said the filmmakers. The producers, S A Media and People Media, are planning to conduct auditions for aspiring actors in USA very shortly. Interested actors can mail their profiles and photographs to the following mail ID – spmedia.usa@gmail.com. For further Info Contact: 425 209 1418.